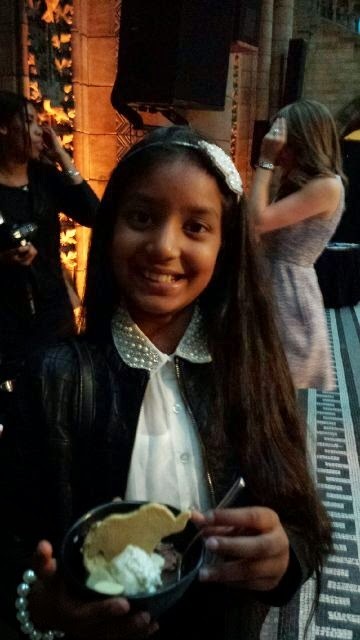 Hannah Chowdhry Redbridge's Mary Anning! 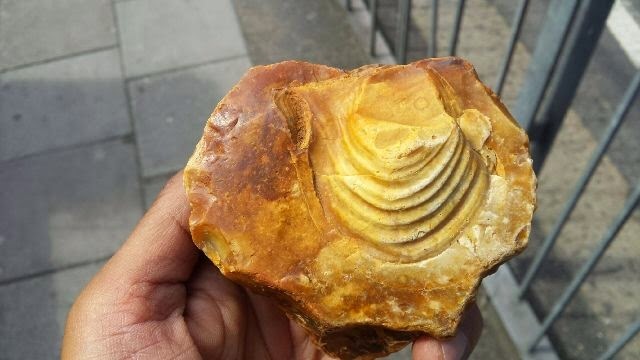 A rare find - a fossil sourced via Brett Lafarge's quarry in Romford. This is an Inoceramus' bivalve that has been enclosed in the flint. 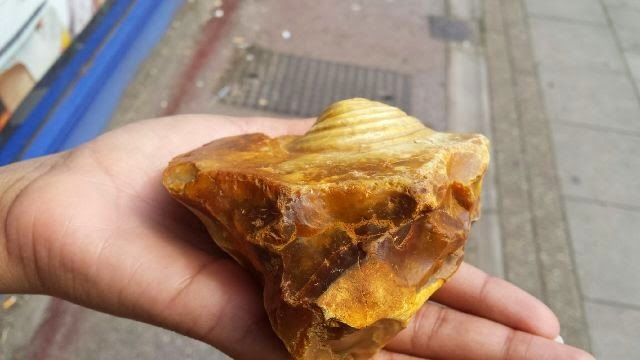 The original shell has been dissolved during the process of the formation of the flint to leave an exterior mould of the original shell of the bivalve. 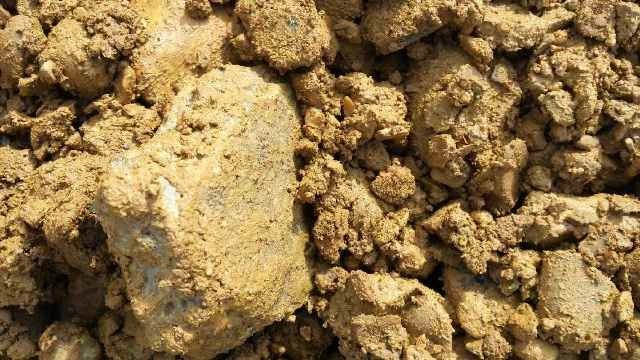 Most of the gravel you will have collected is flint that originated at certain horizons in the Chalk. Unfortunately at > 65 million years it is not contemporary with the Mammoth but interesting none the less. Thanks for telling me about your find." "I was once given an Inoceramus by a French farmer when we used his Chambre d’hôte for the night but I have not found one myself. Fossil echinoids (sea urchins) are more common but still comparatively rare when considering the totality of the flint. Shells of Inoceramus are common right through the white Chalk itself and are useful in distinguishing the different layers as they evolve through time but they are not so commonly preserved in flint." 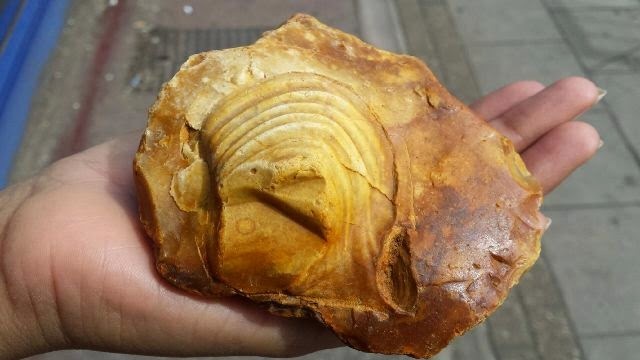 "I feel very proud of myself for finding this second fossil. It was covered in muck but the strange lines stood out for me. I immediately washed the fossil and suddenly noticed how bright and colourful the stone was. It looked so beautiful." 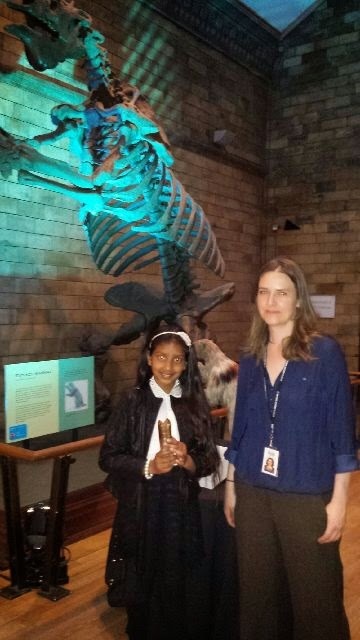 "I learnt about Mary Anning and her famous fossil collection whilst reading a horrible history book. She used to sell fossils she found on a beach near where she lived. One day I want to be a famous fossil hunter too!" 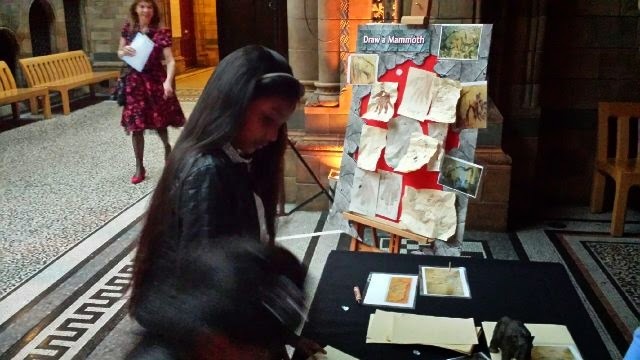 Hannah was also inspired by the large Plesiosaurus dolichodeirus known more commonly to us as a Plesiosaur (a large sea creature), which is currently displayed in the Natural History Museum (NHM). She saw this whilst on a private tour to see the huge collection of pre-historic remains found in Ilford in the NHM archived collections. 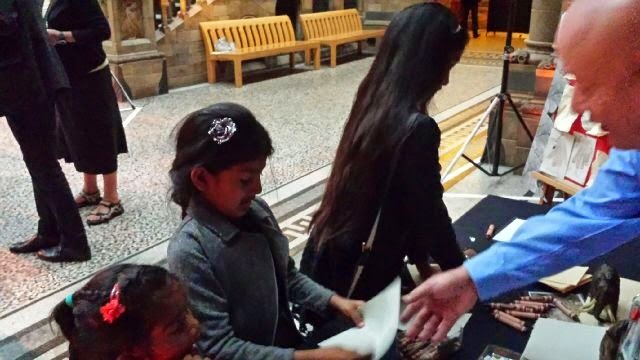 The Plesiosaur is in a public gallery but after Hannah asked about Mary Anning Professor Adrian Lister kindly took children to see the wonderful find and described the amazing feats of Mary Anning often referred to as "the greatest fossil hunter of all time." 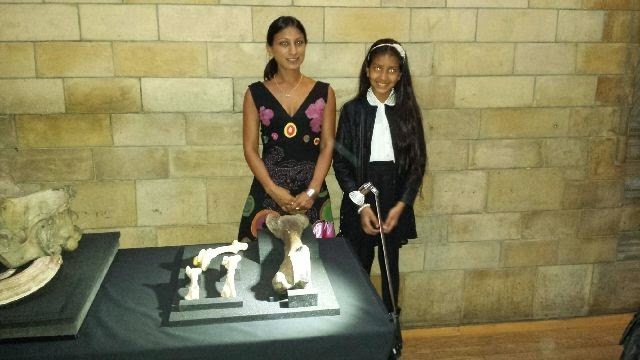 Hannah Chowdhry was also the inspiration behind our current EIBP project to bring the Ilford Mammoth home. 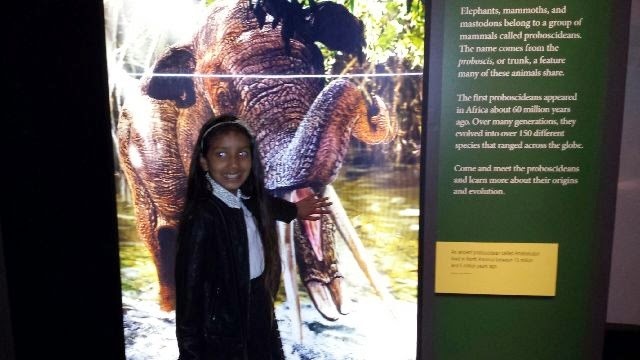 When she saw the Mammoth skull at the Natural History Museum during a trip with family in 2008. 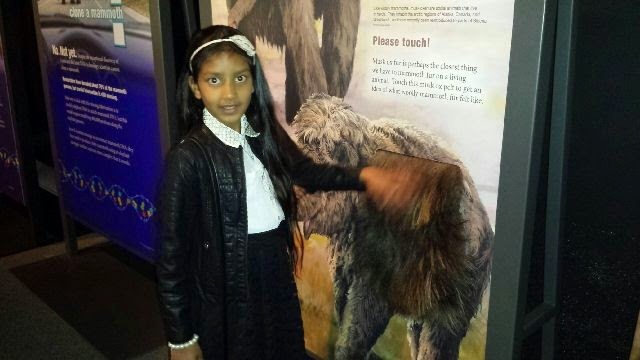 She said; "This mammoth belongs in Ilford, look it even has our town name on it [talking about label referring to Ilford Mammoth]." She asked her father to bring it home and a project began." We would like to thank the Brett Lafarge Quarry at Romford to collect gravel for our Mammoth display project. 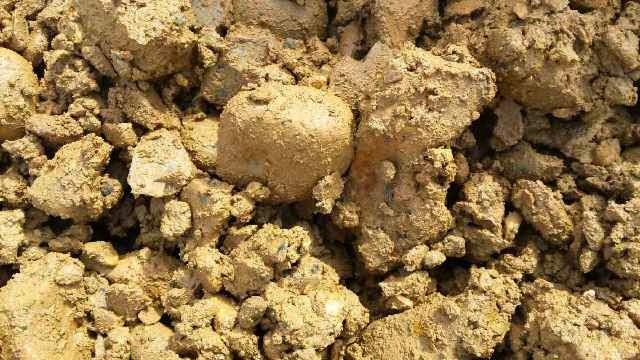 Freshly dug gravel form which the fossil was found. Fresh mix has larger and smaller stones. larger stones are later broken down into smaller sizes for use as construction material. 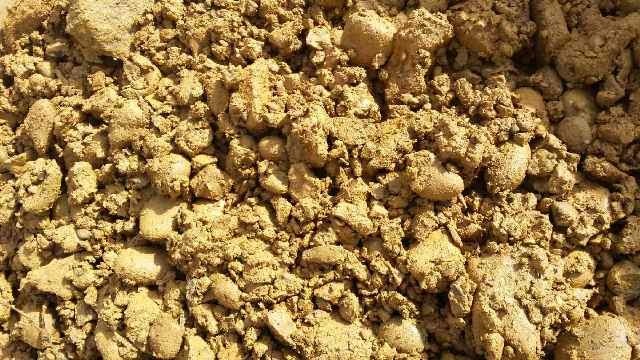 A slimy clay covers freshly dug gravel. 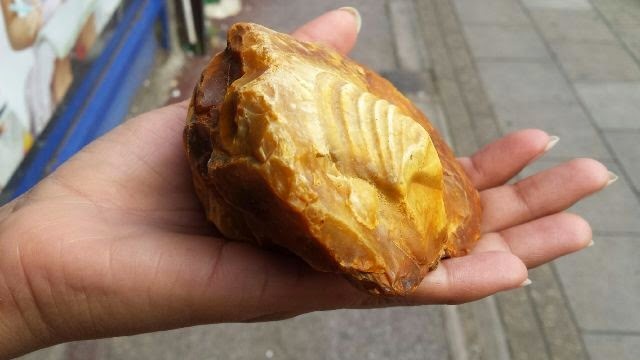 The stone containing the fossil looked very attractive after washing. The fossil found will be displayed in our potential mammoth display cabinet if funding is gained. A rare find and one that young Hannah is extremely proud of. 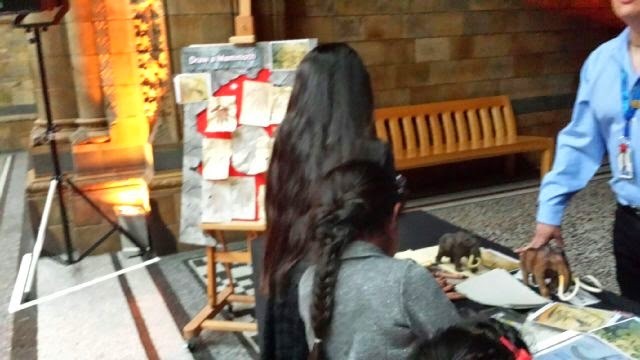 The East Ilford Betterment Partnership has secured funding via the Departmental of Business Innovation and Skills, for a series of free art workshops to promote learning in Natural Sciences. 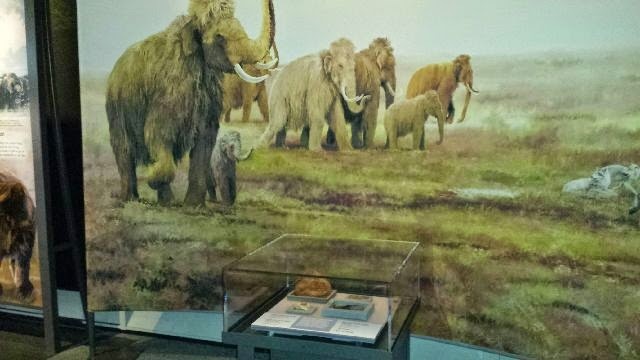 Our event coincides with the 150th anniversary of the excavation of steppe mammoth remains in Ilford by Sir Antonio Brady, and participants will be learning about the famous palaeontological discovery and other local history. 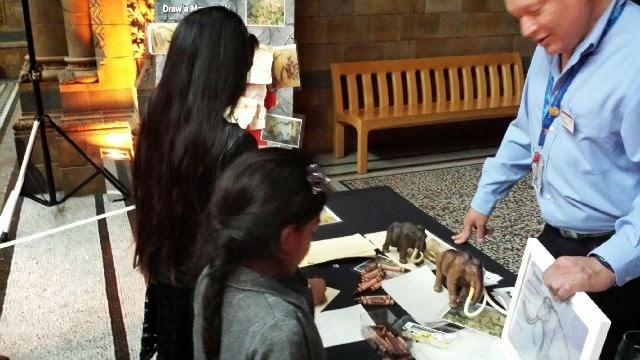 Details: Arts and craft workshops with strong natural sciences learning theme. 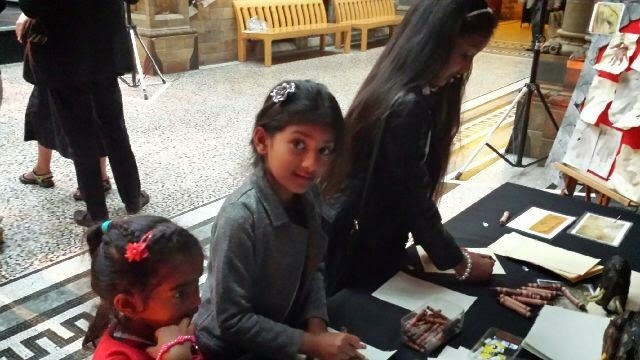 Children and young people will hear a series of short talks from key figures within the field of natural sciences and will produce a range of drawn images to displayed in Redbridge Central Library. Drawn images may include, crystalline structures, mammoths, prehistoric animals, skeletons and much more. 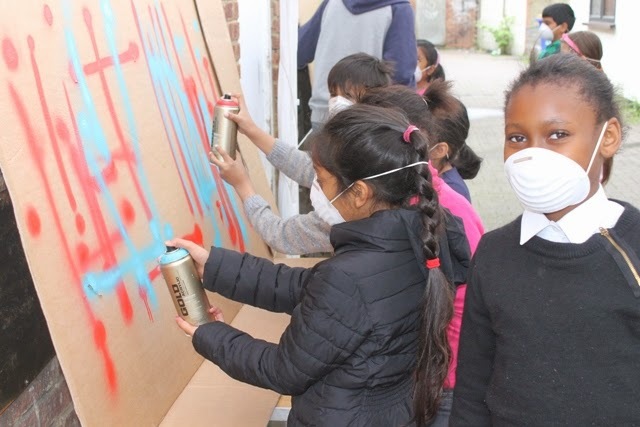 The groups will also produce painted boards that will be displayed around local parks and two 3D maps of Ice Age and Stone Age Ilford that will also be displayed at Redbridge Central Library. This project has been co-funded by the Department for Business, Innovation and Skills (BIS) as part of the BIS Science and Society Community Challenge Grant Scheme’. ‘The Department for Business, Innovation and Skills (BIS) is pleased to support this project which takes science into a community setting. It is our hope as a result of the audience being engaged with this project that they will feel better informed about science issues affecting them and be inspired to be involved further in the future’. 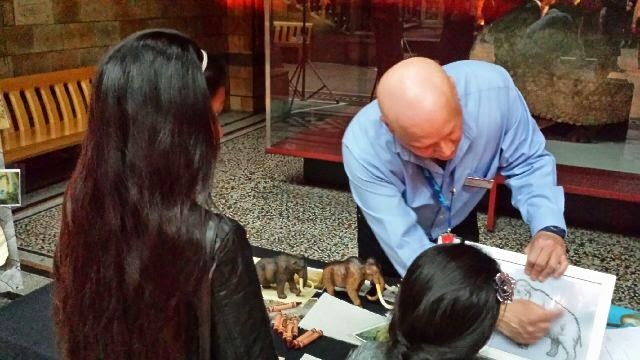 Ilford celebrates the 150th anniversary of the discovery of the Ilford Mammoth this year! 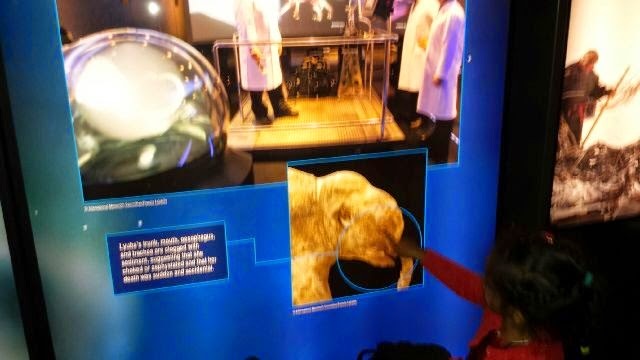 Image of Ilford Mammoth at Natural History Museum. Excavations led by Sir Antonio Brady in 1864, led to the discovery of bones belonging to prehistoric Steppe Mammoths, lions, elephants, giant deer and other ancient mammals. A skull now named "Ilford Mammoth" now resides at the Natural History Museum. It is hoped that a replica will be installed somewhere in Ilford Town Centre to coincide with our event. The dates set for the the borough celebration are 27th -28th September 2014, and local history groups will be joined by wider more established groups, to promote Natural and Life Sciences locally. The event is funded by the Department of Business, Innovation and Skills. Activities: International Food Stalls, Music, Dance, Drama, Singing, Bouncy Castle, Funfair, There will also be a Natural Science Activities including Quizzes, Treasure hunt, Badge Making, Mammoth making, Recycled Mammoth badge making, Pseudo archaeological digs, art workshops and much more. Price: All activities will be free. "Few people in Redbridge are knowledgeable on the great prehistory that emanates from our borough. When Mammoths once roamed Ilford the area was a beautiful Savannah and although we are now far removed from this idyllic landscape, the significance of the finds is best recognised in the fact that the Ilford Mammoth is the only complete mammoth skull ever discovered in Britain. " We hope that the event and our project will create a lasting desire to learn more about the Natural sciences, Earth sciences, Life sciences and our colourful local history. Moreover, we hope the replica of the mammoth skull will draw international visitors to our borough and create a stronger sense of local pride." 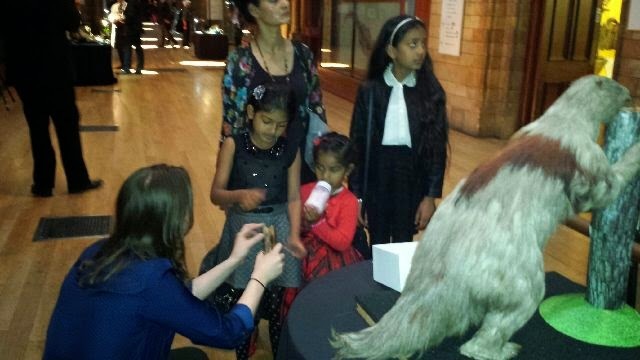 Natural History Mammoth Exhibition could be prelude to Ilford celebration! Wilson's children drew images of a mammoth similar to ancient cave paintings. 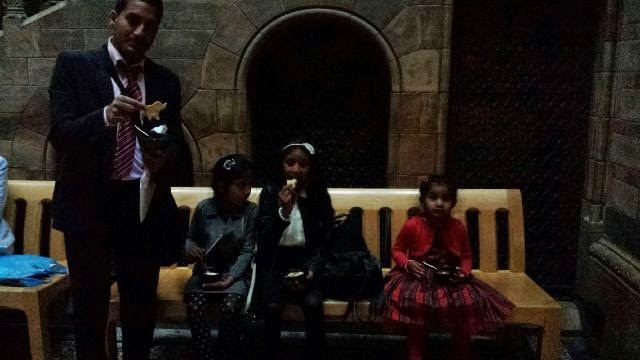 Wilson Chowdhry and his family were one of only 190 guests invited to the launch of the Natural History Museum's Mammoth Exhibition. 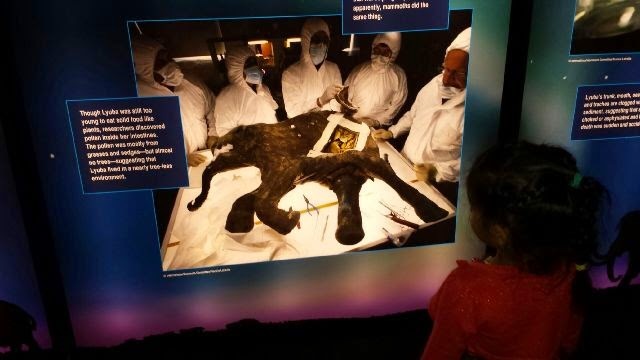 The key attraction at the exhibition is the actual body of Lyubia a baby mammoth that was excavated in Russia. Lyubia is the most complete mammoth ever uncovered and is on loan for the length of the exhibition, which ends 7th September 2014. 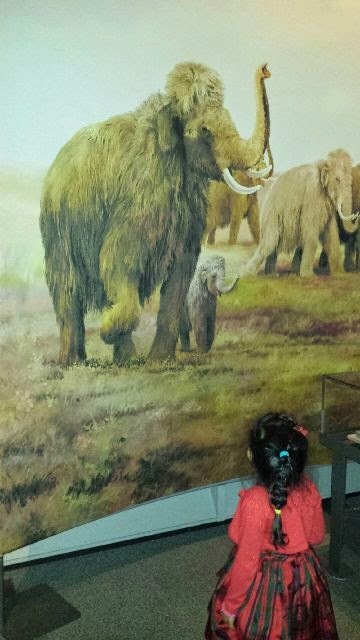 "The big mammoths were scary and I kept thinking they would come to life, but the ice cream was very tasty"
"I felt very excited going into the museum late at night. I have never seen the museum so empty, parts were creepy. 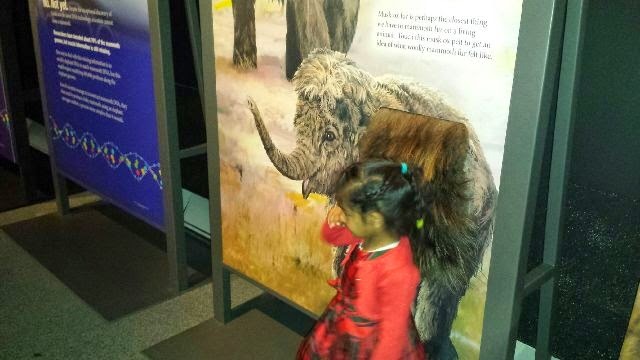 The Mammoth Exhibition was very exciting, the baby mammoth was very cute, I wish they were still alive today." It was a privilege to be invited to this wonderful Mammoth Exhibition launch. Having seen the exhibits and the interactive displays, I would recommend the exhibition to all Redbridge residents as there is something for everyone. Ilford is steeped in Mammoth history, and excavations here led to discovery of the only complete mammoth skull ever found in the UK." 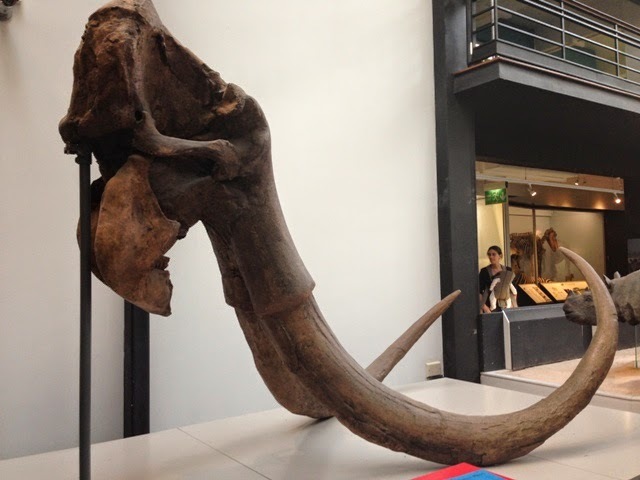 The East Ilford Betterment Partnership are working on a project with the NHM and Redbridge Museum, that could eventually lead to the installation of a replica of the complete mammoth skull found in Ilford. The EIBP also hope to hold a mammoth celebration in Ilford Town Centre to commemorate 150 years since Sir Antonio Brady excavated mammoth remains locally. 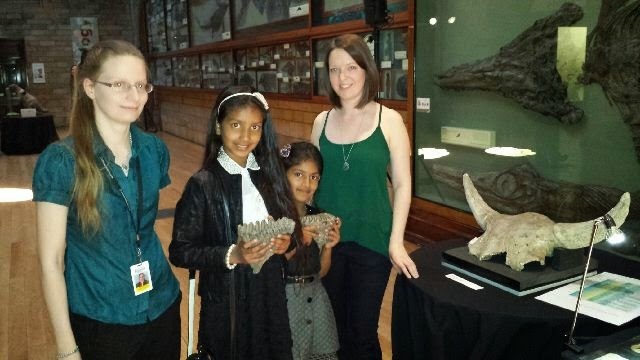 Supervised by capable NHM Staff Hannah and Naomi learnt how to use their hands to create the mammoth shapes. Young children were given clear instructions on how to use this ancient form of art. 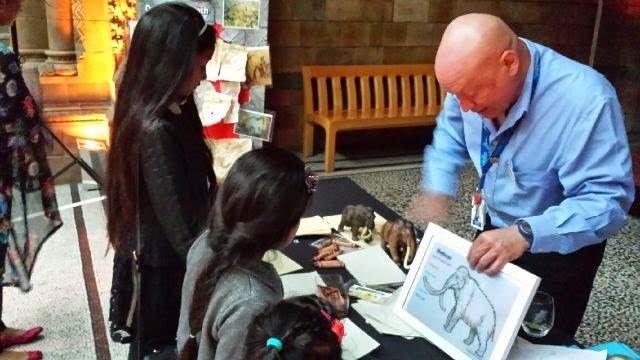 Mammoth images allowed children to compare their artwork with the actual shape of mammoths. Children were taught about scale and size. A very popular activity that children instantly migrated towards. The mammoth models helped children to conceptualise their art. Attentive to the very end. An illustration of the use of tusks in battle and their purpose in attracting mates, fascinated children (we think they just adored the toys!). Mammoth wafers in ice cream were a special treat. Even the adults could not resist! 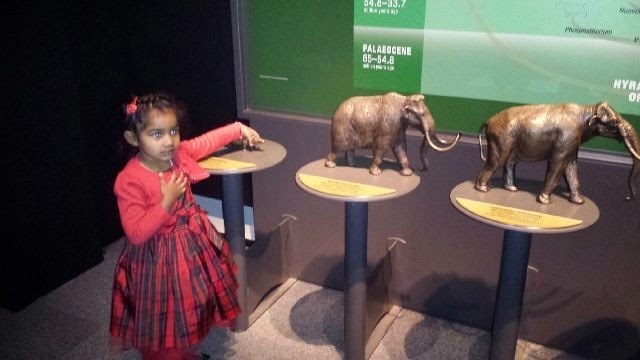 Mummy I found a mammoth! A wonderful evening in the museum was filled with surprises! 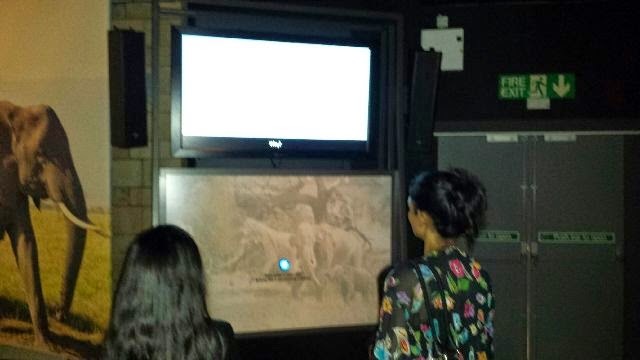 Screens displayed the history of mammoths in moving images. Mammoth teeth were on display and illustrated the huge size of the mouths of these prehistoric beasts. 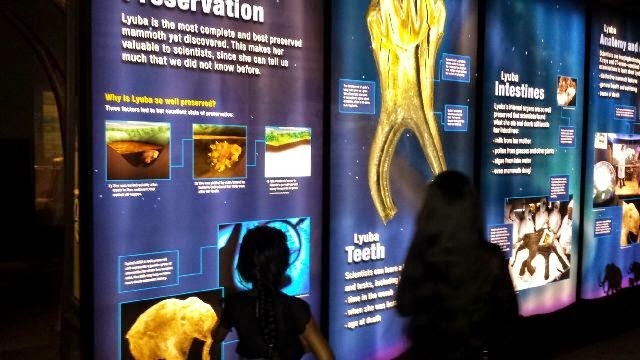 Teeth from an ancient predecessor to contemporary sloth illustrated its huge size. A replica skeleton is one of the oldest exhibits in the Natural History Museum. Wilson could not resist a picture. 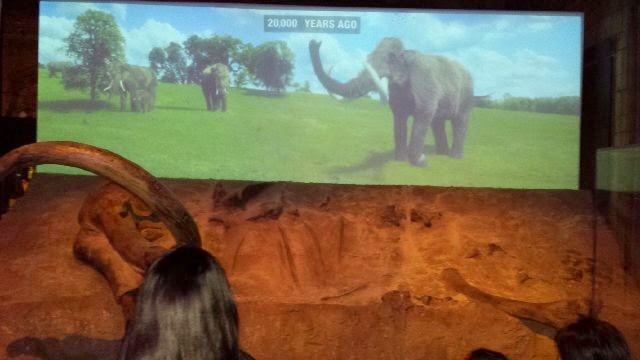 Moving images illustrated the evolution of mammoths to elephants. 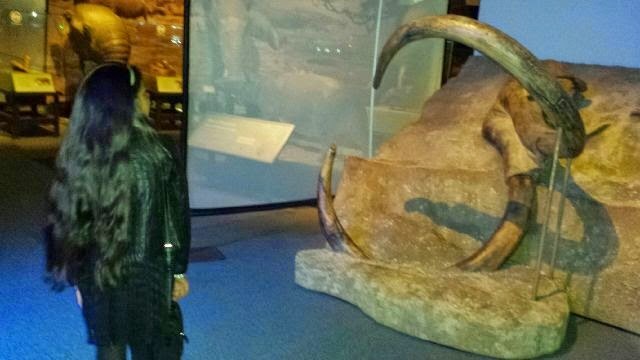 Replica tusks and mammoths filled the exhibition. No Leah, it is not a removable toy! Images of elephants contextualised the evolution of mammoths to elephants. Replica mammoth poo brought out some giggles amongst children. 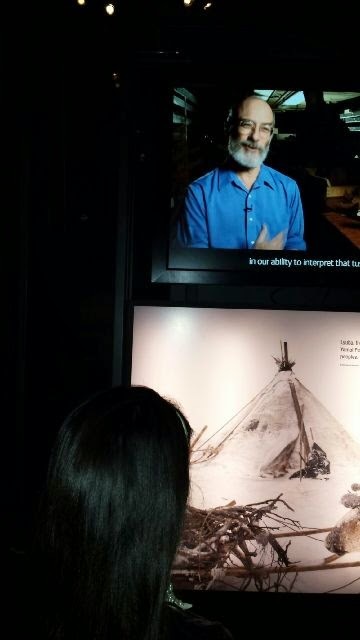 The displays were extremely eye-catching and informative without being over-written. Wow this feels like real mammoth fur! Mummy I want a baby mammoth. Images caught the eyes of all visitors! I can see the eyes! Err? My nose is not that big? Wow is this how people lived? 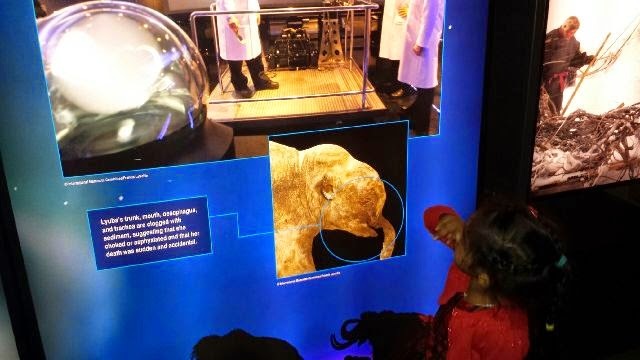 Enter the amazing world of some of the largest creatures to have ever walked the earth in Mammoths: Ice Age Giants at the Natural History Museum. 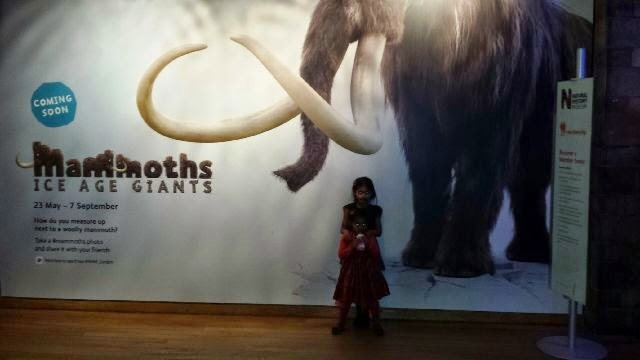 Be awestruck as huge fossils and life-size models of mammoths tower above you and come face to face with the powerful trunks and tusks belonging to these great beasts. You’ll even be able to try out life as a mammoth: tusk jousting, trunk moving and feeling the weight of the hundreds of kilos of food a mammoth ate each day, equivalent to 230 bags of sugar. 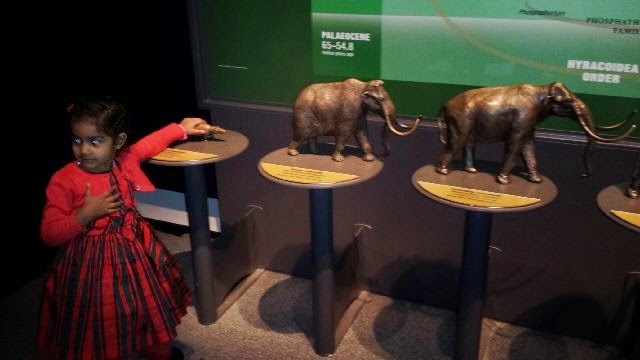 The exhibition will take you on an inspiring journey from the time when these titans roamed the land through to today’s research into the causes of mammoth extinction and ways to protect their precious modern relative, the elephant. Meet some of the best-known species, from the infamous woolly mammoth and the spiral-tusked Columbian mammoth to their island-dwelling relative the dwarf mammoth. Discover prehistoric giants such as the mastodon, the fearsome sabre-tooth cat and the giant cave bear. Find out how they evolved, uncover their environment and behaviour, and consider how they finally went extinct. * A voluntary donation is included in our admission ticket prices. 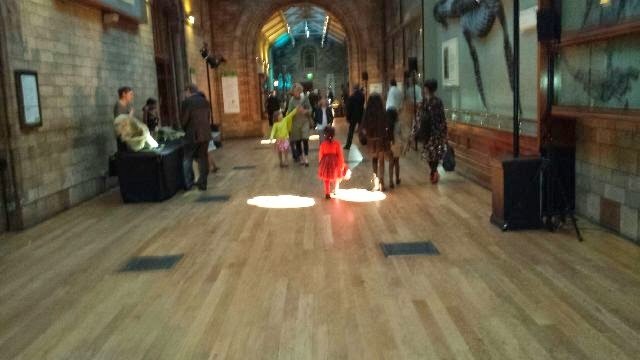 If you are a UK taxpayer and pay the ticket price including donation, the Natural History Museum can reclaim the tax on the whole ticket price under the Gift Aid scheme. Police action on Ilford Lane pushes prostitution into other areas! 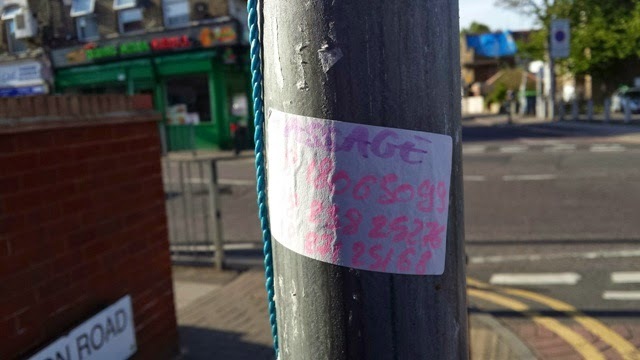 Cheap adverts like these awful stickers are becoming more commonplace around the borough as Police efforts to remove prostitution form Ilford Lane, result in a new wave of brothels across Ilford. The problem has been reported to Police since our Distraction Theft Police meeting held in February. 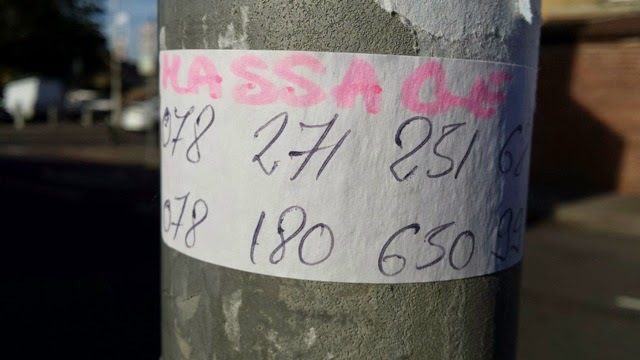 Yet adverts of this type seem to be proliferating and rather brazen women have recently took to the streets and tried to thrust their "business cards," into the hands of unsuspecting single men, innocently travelling along public walkways. 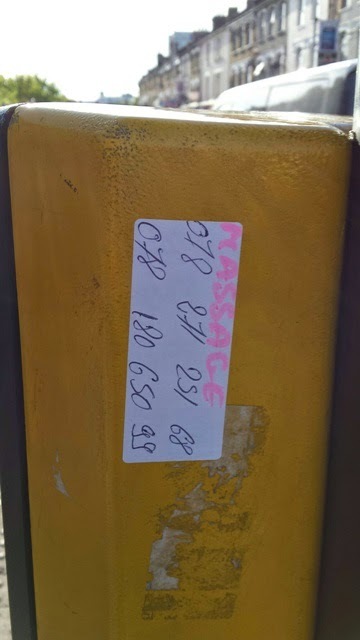 Concerns about a particular brothel currently being run from Gordon Road (door number known), has meant that these stickers now appear on every lamp post on Gordon Road and Green Lane. Moreover one of the neighbours who has three daughters, is concerned at the huge amount of footfall into the property throughout the day and night, and the quite considerable antisocial behaviour it has attracted. Our Local ASB Team has been informed of serious noise levels emanating from the property - not related to the business activity - I must add. However, our Local Neighbourhood Police Team have had to stop their work on this social malaise, due to a special police operation that is underway. I tried calling but... In regards to XXXXXXXX. We are aware however, as previously explained Its being looked in to but with specialist units. I cant reveal to much but its being looked in to. All of the above means that residents are going to have to bear with the problem for a while longer, while investigations take place. I have been told the stickers I have sent photographs of, have been used to identify the venue for the illicit activity and that Police have confirmed that the address is suspected for other criminal activity also, including drug trafficking. 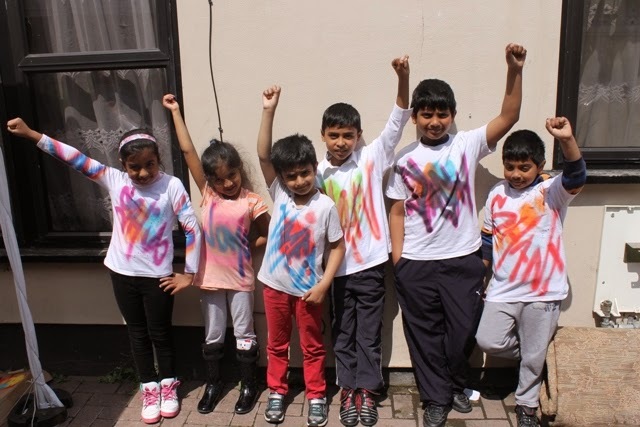 Children from Clementswood Ward, Ilford, gathered at the location of their new art creation at Loxford Park. A new art board created to highlight the benefits of peace was installed to the railings of Loxford Park yesterday (29.04.14). 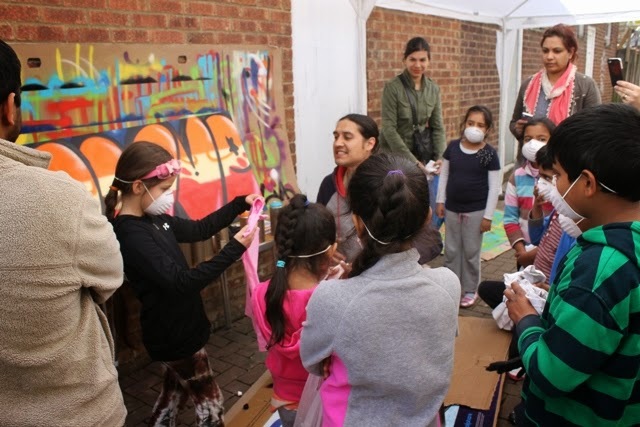 The East Ilford Betterment Partnership challenged local children to design a piece of art that would highlight the pain and suffering that war can bring, while reflecting on how peacetime can generate great hope. Local children from Clementswood Ward learnt about the severe loss of life during World War 1 at a series of art workshops in February. Talks via members of the local TA centre and other local community leaders highlighted the futility of hatred and the need for tolerance. 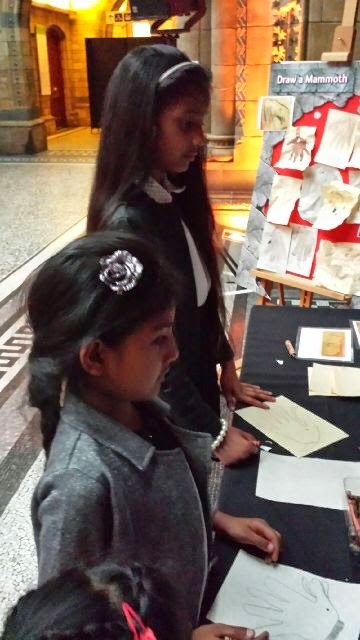 Children contemplated on how the world had changed over the last 100 years and created individual 3D poppies, that were showcased at Redbridge Central Libraries exhibition foyer (1st floor), from February to March. 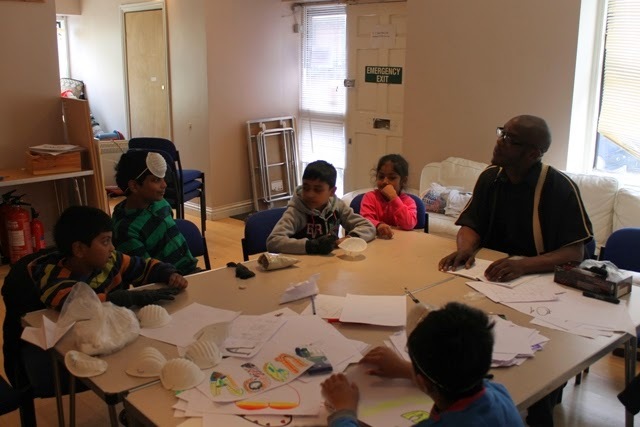 The art workshops which were funded by London Community Foundation were held at Clementswood Community centre and were led by local artist Matt Ryan AKA MYCO. "Children developed significant art skills and each participant created one of the poppies in the two zeros within the image. The idea behind the design was a concept the children developed collaboratively and expressed a perception of new life and hope, that change over time has fostered." "Millions lost their lives during World War 1, which in all honesty had little purpose and benefited no-one. 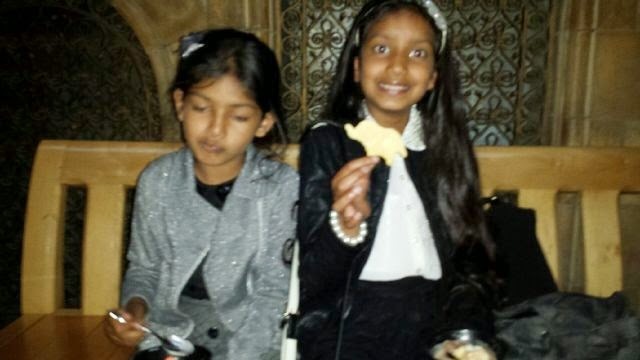 We hope the lessons children learnt about the value of life and the need to be more accepting, will make future society a better place to live." "The art board displayed at Loxford Park will be a reminder to people of all generations and diversities, that we must all be prepared to make the changes we feel are necessary for a fairer world." 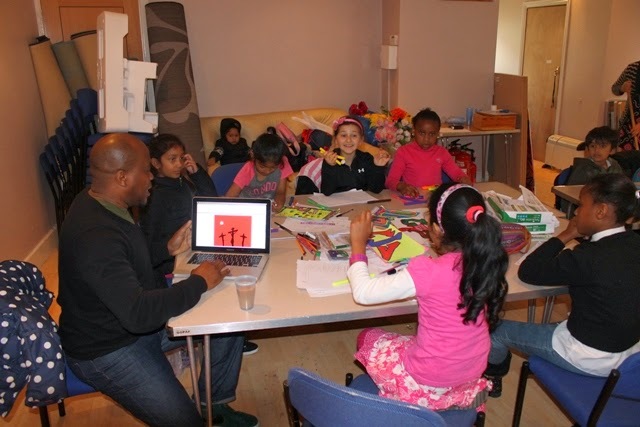 "My Redbridge" art project changes lives. 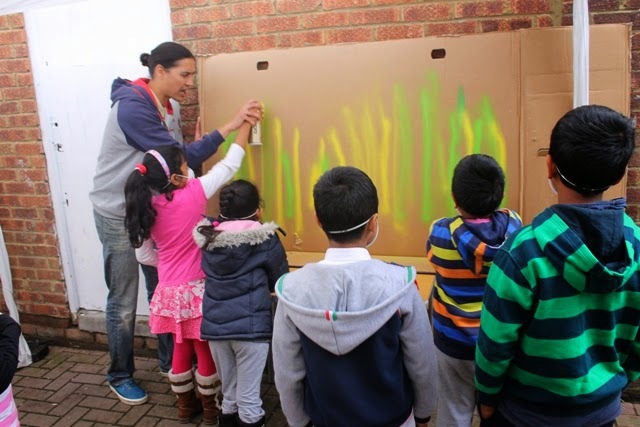 The "My Redbridge" project began in 2010 and has seen a flourishing of art in our borough. 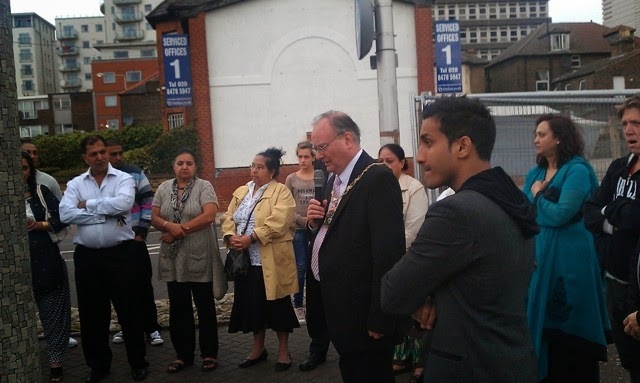 The project had a simple vision which was to tackle the ongoing lack of public creative art investment in Ilford South's deprived communities. The lead group for the project is the East Ilford Betterment Partnership who were a group created by Redbridge Regeneration Department under the auspices of Beverly Stratton. They were originally a Local business partnership but as more local residents filled the membership, the group focus changed. Our project plan was to utilize the skills of experienced and accredited artists from different spheres, to develop art opportunities for children and young people primarily form the wards of Loxford, Clementswood and Mayfield, in particular those from impoverished backgrounds. 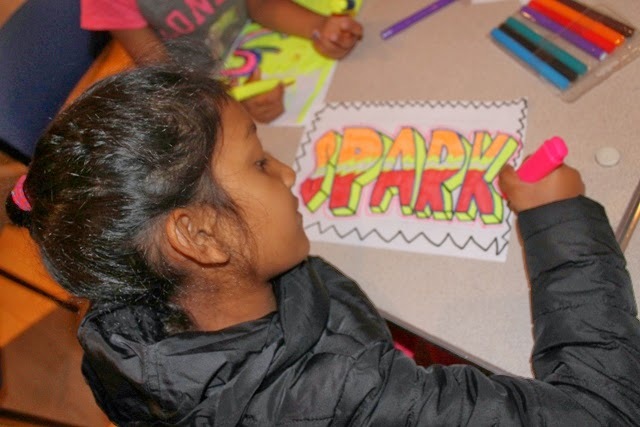 We did not just want our projects to be a series of art classes, but for each art event to lead to public works of art to inspire others to try something new and encourage communities by instilling a sense of pride for their local areas. We also desired to create culturally enriched communities, with stronger cohesion, tolerance and knowledge of their local heritage. Community consultation played a large role in the work that we have completed so far. Our first project the Redbridge Peace Monument took two years to complete and initial designs provided by the artist were rejected several times. We held four Community Consultation meetings, and consulted with over 72 different people form the local business and residential community and finally decided on the existing design. Moreover a public poll indicated that 86% of Ilford Recorder readers approved the project. 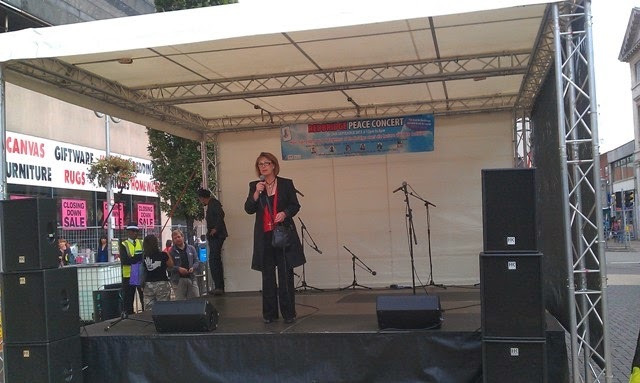 The installation of the main structure on September 20th 2011, five years after the murder of Kashif Mahmood was attended by over 5000 people, during Redbridge's first ever outdoor public event for the London week of peace. Two years later 22 children had their mosaic designs inserted into the base of the monument. After having attended a week long art workshop at Clementswood Community Centre. Wilson Chowdhry meets mother and father of slain teenager Kashif Mahmood at Redbridgse peace monument located at the location of his murder. Parvin Mahood, Mary Foley Mother of slain teenager Charlotte Polious killed on Ilford Lane nearby, and - Mary Large mother of Jack Large were all involved in promoting and developing this project. Ann Oakes-Odger MBE mother of teen victim Lesley Oakes Odger spoke of the pain she went through and great sense of loss after the murder of her son two weeks before Kashif. Her campaign say the duration of life sentences for murder in the UK extend to 25 years. 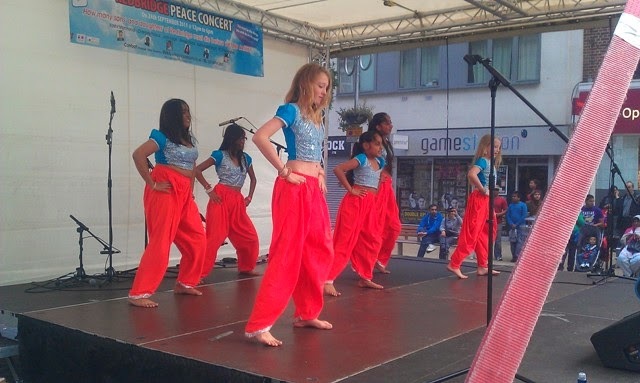 Children performed at a diverse concert promoting peace. Many had their first ever public showcase of the their talents. Mayor of Redbridge Chris Cummins presided over the inauguration of the monument. 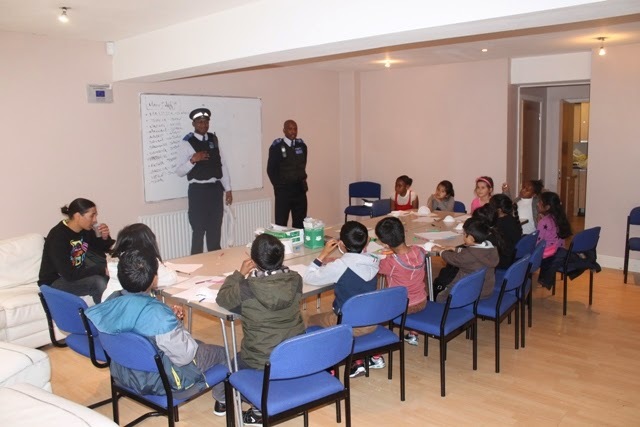 We held a series of childrens workshops in tandem with the young peoples project. The designs from both courses were created into graffiti boards and placed around South Park, Ilford. We later moved then to Loxford Park and hope to move them to Goodmayes Park next. Feedback from local residents has all been positive. Furthermore the best ideas were sprayed onto the walls of our community centre. This public art feature has now become a positive talking point in our neighbourhood, awareness of our community centre has increased and subsequently so has attendance at our community meetings. 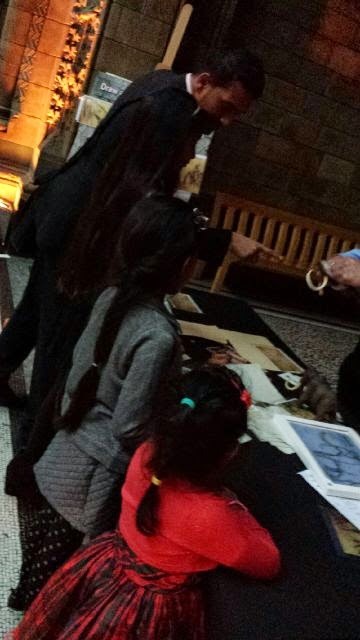 More then an art course children and Young people met with the police who spoke about the hurt and pain crime can cause. Our intent was to inspire art with a message. The children learned to write tags their nicknames in graffiti. Pastor Bryon Jones from Eden Christian Centre spoke of the Christian perception of peace and love, he shared images that might inspire peace. Children had fun with the spray cans. Matt Ryan AKA Myco demonstrated how to use the cans effectively. Mozam (prayer caller) Bilal from Green Lane Mosque talked of the Islamic principles of peace. He also provided faith symbols to inspire the art. There was one representative form all the key faiths in the borough. Families came to see the children at work. 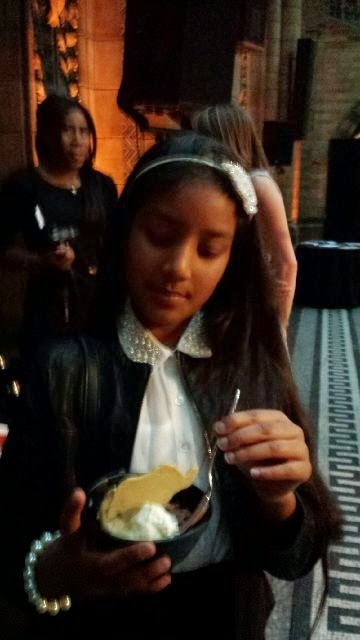 Participants were rewarded with sweets and certificates after a long week of learning. Their art board "Love" is currently fixed on the railings of Loxford Park. The children received T-Shirts with their nicknames sprayed on. We now take you back to Redbridge Peace Monument as the original structure was bereft of the children's input, that mothers of victims of knife crime and the entire community desired. However our intent form the nascent phase had been true. 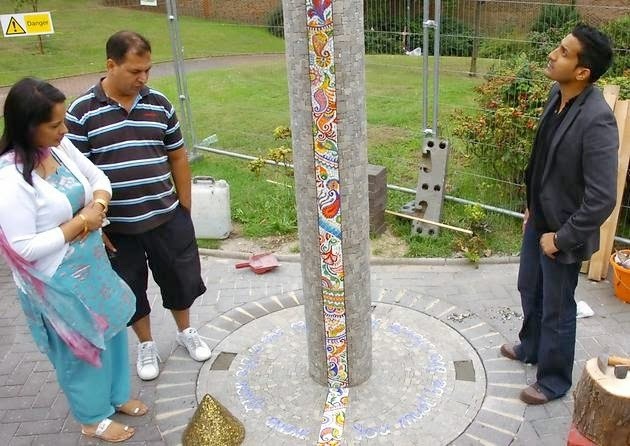 In May 2013 after holding a series of art classes with children form local primary schools we inserted square mosaic art designs created by local children into the base of the monument. They too were spoken to by many local community stalwarts and their works of art were amazing and tested a whole number of new skills, which were developed over the week long course. Children work on mosaic designs using very technical cutting and shaping tools. Each time they make a new design they would draw it first on the base plate. This flower by Julia represents new life. This star by Kian represented hope. Children with their one of their many mosaic designs. 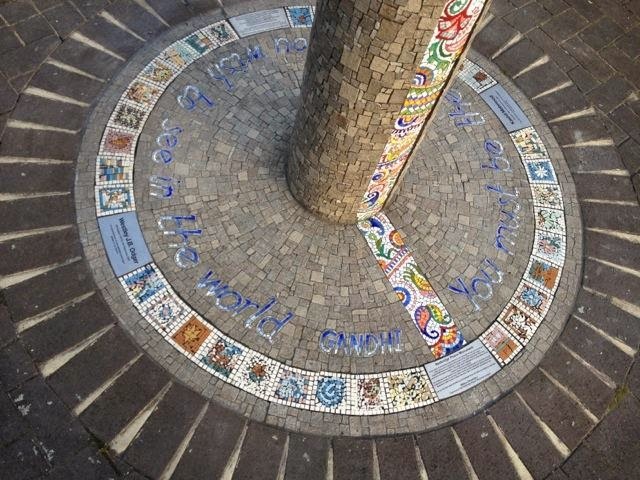 The Childrens artwork can now be viewed within the base of the Redbridge Peace Monument at Winston Way subway. The art work that was not used can still be viewed in a glass cabinet located on the first floor foyer of Redbridge Central Library. At last our monument is complete. The Idea behind our latest project arose during the Community Centre Mural. Local people felt Redbridge would benefit from a similar art project on a larger scale that could inspire local people. A consultation with over 400 people through an e-survey and various project meetings resulted in the desire for a work of art that would proudly describe Ilford's heritage. 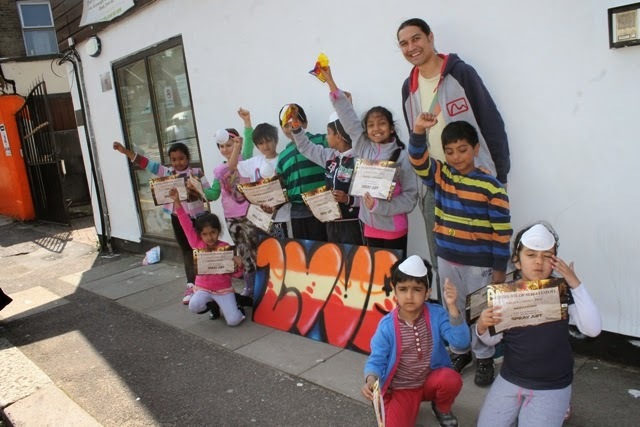 At the end of both the spray art course and mosaic art course, participants reciprocated a desire for a piece of art that could illustrate the contribution Ilford has made to the UK or even the world. At two further art courses, one at which we produced an art board to honour slain military drummer Lee Rigby, and one in which young children learnt about mammoths that once roamed in Ilford, with lessons of tolerance generated through the travesty of World War 1 children started to form ideas for what they would like to see on a large scale art project. Initial idea's centred on the Ilford Mammoth which took so many children by surprise and created great excitement. Eventually other ides started to generate as local historians provided a range of examples of the great success of local people. It was during the first set of art classes that one of the young offenders suggested that we should create some artwork on the large pillars of the A406. He described the pillars as am important entrance to the borough with a network of main roads. When we put the idea forward to various groups of people a unanimous support grew for this location as a site of great importance and art opportunity. When we sought permission for artwork at the location, in our first conversation with Jane Leighton she expressed in no uncertain terms that the site was earmarked as a pivotal location for art, she stressed that any art at the location is required to be professional. We then explained that although the inspiration has come form children the art itself will be drawn and implemented by a professional artist. hand gesture to the less provocative 'Peace' hand gesture." An artist was chosen by proxy at a project management meeting in January this year. Matt is a professional artist (painter/illustator/graphic designer) with around 18 years experience. I have produced re-branded hoardings/signage for independent business around London. I have produced sets for TV (Gamezville series 1&2 - Sky 1 and MTV) and for a variety of music videos. I have also exhibited my work privately around the country in galleries and as part of larger festivals. Matt has Developed and Delivered OCN accredited courses in spray art for local councils and other organisations across London and the UK including; Connexions, NHS, Home Office, Disability charities and many other organisations Mr Ryan's work has been displayed (for purchase) as part of gallery exhibitions at London Hip Hop festival, Brighton Hip-Hop festival, "Cans" festival, Stolenspace Gallery; London, One Deco; London, "Upmarket" London. Matt was selected out of a list of 6 artists after a selection of CVs were presented at the meeting. Local people were simply awestruck by his work on our community centre walls and the noted cathartic change in young people involved in his first course. We estimate the pillar is approximately 10 metres wide and 20 metres high. We await correct dimensions from Cliff Woolnoth who is in communication with TFL. We have secured all the funds for the project and have even introduced the art project to local people and Councillors at the Area 6 Committee Meeting. There were no objections only several very positive comments. Kenson Contractors have agreed to provide any scaffolding requirements for free, and will provide all necessary barriers and cones for the project. A full risk assessment of the project will be undertaken by Wilson Chowdhry who holds a current Prince 2 Qualification and Nebosh General Certificate, prior to commencement. This will be submitted to all parties before any work is carried out. Wilson has successfully carried out a carnival every year for the last 9 years. As a requirement for these events he produces Event plans, Risk assessments and method statements for these events that now boast the largest attendance of any similar event in the borough. The mural will be produced using a combination of acrylic paint applied via brush and roller and a range of acrylic spray paints. Some more detailed elements (such as text / sponsor logos) will be applied using pre-cut stencils so as to ensure maximum accuracy. I will be the sole artist working on the project. The mural would take 5-10 days to complete. No wonder we're in the s**t!